A comedy of manners that explores the unease behind the manicured lawns of suburban America from the Orange Prizewinning author of A Crime in the Neighborhood. Littlefield, Massachusetts, named one of the Ten Best Places to Live in America, full of psychologists and college professors, is proud of its fine schools, its girls' soccer teams, its leafy streets, and charming village center. Yet no sooner has sociologist Dr. Clarice Watkins arrived to study the elements of "good quality of life" than someone begins poisoning the town's dogs. Are the poisonings in protest to an off-leash proposal for Baldwin Park - the subject of much town debate - or the sign of a far deeper disorder? Certainly these types of things don't happen in Littlefield. With an element of suspense, satirical social commentary, and in-depth character portraits, Suzanne Berne's nuanced novel reveals the discontent concealed behind the manicured lawns and picket fences of darkest suburbia. No one was very surprised when the signs began appearing in Baldwin Park. For years people had been letting their dogs run free in the meadow to the west of the elementary school without attracting much notice; but once an authorized off-leash "dog park" was proposed and a petition presented to the Littlefield Board of Aldermen, fierce arguments erupted over whose rights to the park should be upheld, and the town broke into factions: those who loved dogs and those who did not, at least not in the park. 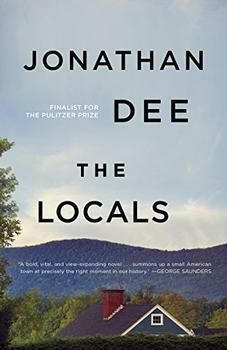 ...this isn’t just a novel of ideas; Berne’s scrutiny of upper-middle-class suburbia is also grounded in specific scenes that offer rich fodder for satire: a town meeting, a dinner party, and a book group (particularly ironic since Berne’s novel itself is more than likely to spark heated discussion at countless book groups). Frequently hilarious, always intriguing, Berne’s foray into the dining rooms and psychotherapy offices of Littlefield will prompt readers to look anew at their own aspirations and relationships. (Reviewed by Norah Piehl). A look at suburban life that manages to be both scathing and sympathetic, Berne's latest is a smart, amusing satire. Her unique voice comes through in the combination of a forensic approach to her characters' foibles and lyrical descriptions of the changing of the seasons in New England. This is an apparently light tale but there are dark shadows in Littlefield too. Berne's novel is both absorbing and amusing, and lingers in the memory. Well-observed shrewd satire … sharp, funny and painful. Berne takes the domestic and turns it into the majestic. A compelling, poignant yet unsentimental novel that examines life, love and loss. Original and brilliant. Brilliantly done. Gentle and often moving. Although the dog poisoning mystery drives the narrative, the novel works best when Berne applies her perceptive tongue-in-cheek voice to the foibles of suburban life, hilariously depicting quotidian problems and trivialities. Starred Review. [Berne] is a sure hand at the dinner parties, school concerts, teacup tempests, and true moments of suspense that make a suburban comedy of manners par excellence. It's too bad about the dogs, but they died for a good cause. When Dr. Clarice Watkins sets out to academically scrutinize one of the "Best Places to Live in America," she notes that the criteria for making the list include "Good quality of life," along with "Quiet and safe." For many years, Money magazine has compiled its own annual roundups of the "Best Places to Live." According to Money, their rankings feature "places with great jobs, strong economies, affordable homes, excellent schools, and that special something that makes it a great place to live."